> Tutorials > How to Remove FairPlay DRM to Enjoy iTunes Multimedia on Non-Apple Devices? How to Remove FairPlay DRM to Enjoy iTunes Multimedia on Non-Apple Devices? If you are an Apple user and purchase or rent movies and TV shows from iTunes Store, you should have known something about DRM protection. Actually, FairPlay is the name of the DRM protection technology that Apple uses to prevent movies, TV shows, audiobooks and Apple Music songs from illegal copy. However, it may also infringe the customers’ “Fair Use” right in using what they purchased legally. Here we will introduce best FairPlay DRM removal software for personal use as below. FairPlay DRM, is a kind of digital rights management (DRM) developed by Apple Inc. to protect some multimedia content types (including movies, TV shows, music videos, music, audiobooks, etc) on iTunes Store. That is to say, the movies, TV shows and audiobooks you purchased, the movies you rent and Apple Music songs you subscribed and downloaded are under FairPlay DRM protection. To make it clear, the rental and purchased movies and TV shows can just be compatible with Apple devices while Apple Music serves more devices including Android phones, but with iPod Nano and iPod Shuffle excluded. FairPlay uses technology of asymmetric encryption, combines a master key and a user key which should be paired. A “user key” is generated when you buy or rent protected movies from iTunes Store or download Apple Music songs for offline listening, and it can be used to decrypt the corresponding master key inside your downloaded M4V videos, Apple Music M4P songs and M4B audiobooks. FairPlay allows MP4 multimedia file format to be built into as encrypted AAC audio layer. 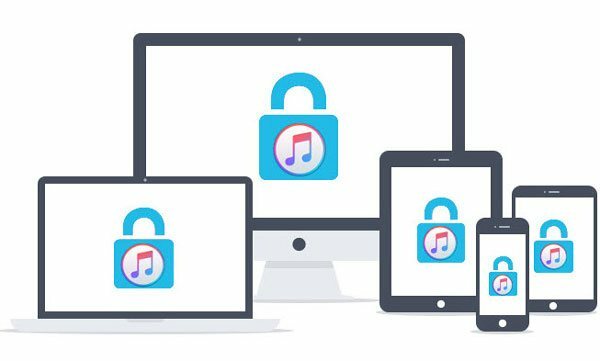 With this DRM, you cannot play what you rent and purchased on iTunes or downloaded from Apple Music on unauthorized devices. That’s why M4V videos can’t be played on Android phones and tablets, Kindle tablets, Windows phones and so on. You can just authorize up to 5 different computers to play FairPlay-protected through iTunes and the devices associated with your Apple ID. Currently, Apple Music is the only content you can enjoy on both iOS and Android devices while movies, TV shows and audiobooks are only for iOS devices. To bypass Apple’s FairPlay DRM, you need to convert the encrypted AAC audio file to common file without any compatible limitations. What is worth mentioning is that it is legal for the file owner to remove FairPlay DRM for personal use. The best way to remove FairPlay DRM is to employ a FairPlay DRM removal software. TuneMobie Apple Music Converter stands out to convert DRM-ed Apple Music to regular MP3 or M4A because of its easy-to-use interface, 100% quality and ID3 tags retaining capacity as well as maximum 16X speed. Let’s learn the straightforward steps of conversion. Step 1: Download and install TuneMobie Apple Music Converter. After you launch the program, iTunes will be launched as well at the same time without any extra operation. Step 2: Choose the Apple Music songs or M4P songs you want to convert and select the audio tracks, set the output format as MP3 or M4A. Other settings can be changed based on your needs. Step 3: Click “Convert” to start after above two steps are finished. Step 4: Simply transfer the output MP3/M4A songs to any other incompatible devices after few-minutes of conversion. 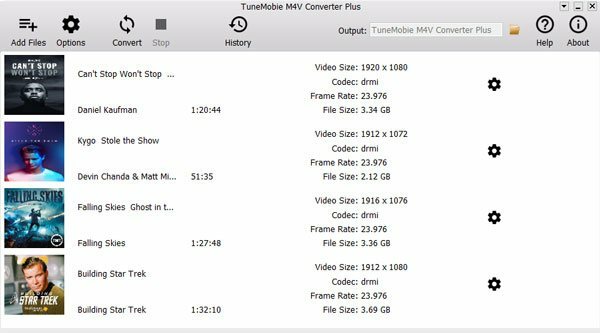 TuneMobie Apple Music Converter is aimed to convert Apple Music songs, purchased iTunes music, M4P songs and more. The output format can not only be MP3 but also M4A, FLAC, AC3, AIEF, AU and MKA. It, on the other hand, can extract audio from iTunes movies, TV shows, MV and home videos. As you understand the method of bypassing the FairPlay DRM of Apple Music, you may have a clearer idea of the way to remove that of iTunes movies. Yes, you are right. You just need to convert the original DRM-protected M4V to commonly used MP4. TuneMobie M4V Converter Plus would be of great help. It is user-friendly likewise. Step 1: Download and install TuneMobie M4V Converter Plus, launch it whenever you want to enjoy an iTunes movie on other Non-Apple device and you will have the iTune movie library and playlists on the screen. Step 2: Choose the movies, TV shows or music videos. And select the audio and subtitle tracks if necessary as the program will keep all by default. The program performs at 30X faster conversion speed. Step 3: Just begin conversion by clicking button “Convert”. Step 4: Copy or transfer MP4 from the output folder to the target non-Apple device with a USB cable. For the iTunes rentals, you have 30 days from the date of rental to watch them, and 48 after you start enjoying, then you won’t have access to them. TuneMobie M4V Converter Plus enables you to convert rental M4V to MP4 and keep it forever after expiration. Listening to an audio story is a great way for leisure and learning. There are many audiobooks available on iTunes Store and iTunes audiobook is in M4B format and comes with FairPlay DRM as well. 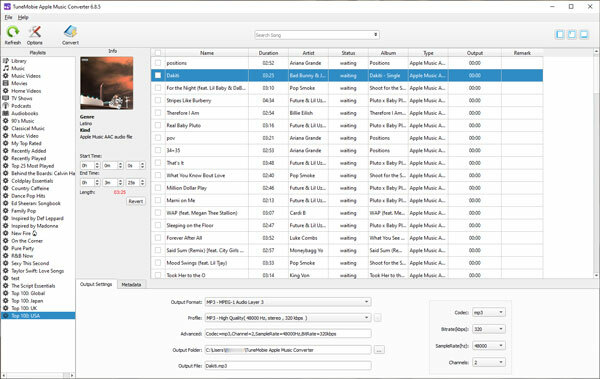 The program TuneMobie Apple Music Converter mentioned above is also able to convert M4B file to MP3 or M4A file. Steps are of course the same as when you convert Apple Music, just select audiobooks in Audiobook playlist instead of selecting Apple Music tracks. All the ID tags and chapters information will be preserved after the converting is done with 100% quality. With TuneMobie Apple Music Converter, you can listen to your favorite audiobook on any devices as you like. I’ve just finished listening to the iTunes audiobook Pride and Prejudice on my Sony Walkman through this solution. The law regarding DRM removal is still not clear but everyone has Fair Use right. Anyway, everyone should pay respect to copyright and never distribute the content converted from the files with FairPlay DRM protection. This is also what “Fair Use” requires. So kindly remind that all the DRM-removed files are just for your personal use. Never put them to business use or spread to others. 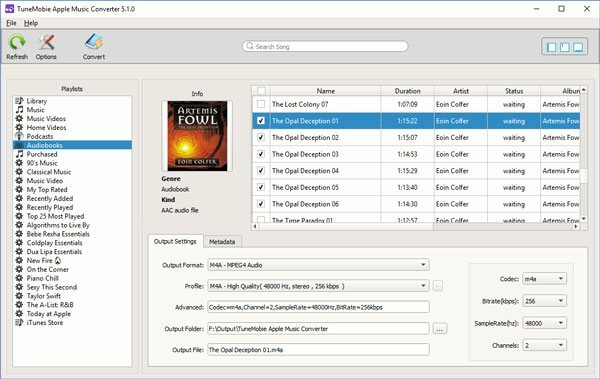 How to Convert M4B/AA/AAX Audiobooks to M4A with Chapters Kept? How to Cancel Apple Music Subscription on All Platforms? What do CC AD SDH Icons Mean in iTunes Store and How to Enable them? Apple Music VS Spotify, Which Streaming Music Service Is Better for You?